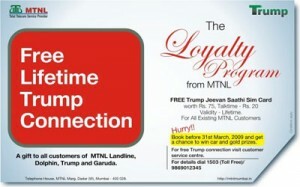 Existing Dolphin postpaid, MTNL Landline and Garuda customers can make a request for the Free Trump Lifetime Prepaid card by the Trump CAF with two Photograph, One Photo Identity proof and copy of producing their last paid bill. There should not be any outstanding amount in their account except the last bill if within due date. Existing Trump prepaid customers can fill the Trump CAF and submit the Photo and Documentary proof as per existing regulations. We Say: In few words, pretty smart move to inflate subscribers. But we wonder had not been there any loyalty program, how many organic subscribers would it garner?